What first gave you the idea for Thunderstone? Thunderstone is a culmination of many ideas, experiences, and influences. The setting and the characters stemmed from a trip that I took with my siblings to Lake Itasca, MN to spread my dad’s ashes in the Mississippi Headwaters. I wanted my story to include a mystic element and decided to incorporate Native American mythology, a natural for the area’s centuries-old untouched forest and the wild, untamed landscape of Itasca State Park. Native American lore has always fascinated me, which made the research a pleasure. Somewhere in that timeframe I read and thoroughly enjoyed the Percy Jackson and the Olympians series, which convinced me that incorporating mythology into my story was a good idea. But the idea for Thunderstone wasn’t simply a one book concept. A few years back, Alton Brown had a series on Food Network called Feasting on Asphalt. Season two was the River Run, where Alton traced the Mississippi River along the Great River Road from Louisianna to Minnesota. While watching the show, I remembered that when we were at Lake Itasca, we talked about meeting at various cities along the Mississippi River to follow my dad’s final journey. I thought “Hey, that would make a good series.” And thus, the Legacy in Legend idea was born. The series concept is that every time the family gathers near the Mississippi River, the main character, Jeni, encounters some kind of deadly spiritual threat. In order to protect herself and others from future attacks, she needs to discover the source of her ability to commune with other worlds. But because the menacing spirits come from various cultures and legends, they provide no clue to her ancestry and she must look for answers elsewhere. The second book in the series is well underway, and I look forward to developing the big picture! 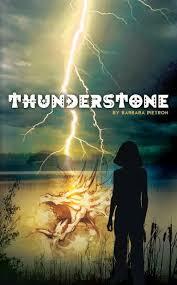 -Thunderstone came out late 2013 and was a finalist in the Indie Fab book awards by Foreword Review. It was also a winner in Amazon’s Breakthrough Novel contest. -Thunderstone is book one in the Legacy in Legend series, which will be released over the next couple years. -A few months ago, Barbara Pietron released a free ebook prequel to Thunderstone (titled Heart of Ice). -Also, separate from the Legacy in Legend series, Barbara Pietron has a new YA book coming out late this year. There was a contest, which has now ended, for voting on a title for this new book.